admin – The Lee Bros.
A 12-city tour is being planned this spring for Matt and Ted to introduce readers to their new book, a “captivating tell-all” about the catering industry, that launches April 9. Atlanta, Boston, Charleston, Dallas, DC, Houston, Los Angeles, New York, Oxford MS, Seattle, San Francisco, and possibly Chicago are in the works, though not in that order! Details will be posted soon. In the meantime, read what others have said about HOTBOX here, here and here, to get a sense of what this book is about. 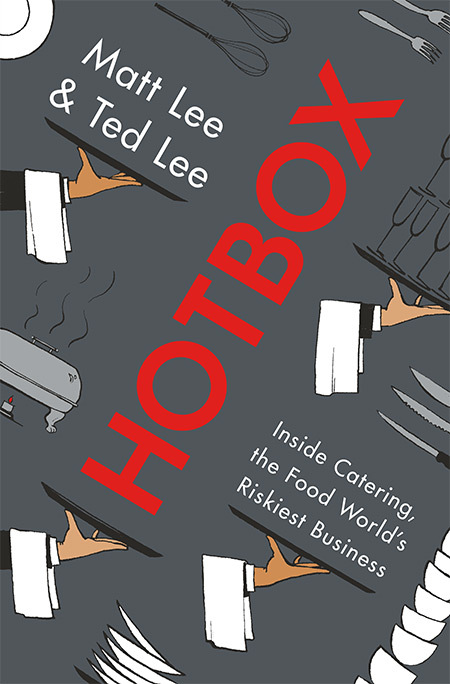 “Matt Lee and Ted Lee take on the competitive, wild world of high-end catering, exposing the secrets of a food business few home cooks or restaurant chefs ever experience. Come Foraging with us in Charleston! We are frequently asked to lead urban foraging expeditions in our hometown–and in other cities as well! Here’s a peek at what that adventure is like. Enjoy! We didn’t know Tony well, but were fortunate to work with him twice—when he traveled to Charleston for his show, and also at a film festival in Florida. Insatiably curious, generous with his time and attention, humble and respectful, he was such a fun and inspiring person to be around, and he influenced us in so many ways. We can’t imagine how sad this loss must be for his close family and friends; we’re trying our best to channel our own sadness into action and resolve—to provide a platform, whenever possible, for the most diverse array of voices to tell deeper, better stories about food and culture. The National Suicide Prevention Lifeline number is 1-800-273-8255; you can also text HOME to the Crisis Text Line at 741741. People are standing by, ready to help without judgment. Join us the SCDA’s Kitchen Stage at SEWE 2018! February 16 – 18th, we’ll be hosting the Kitchen Stage sponsored by the South Carolina Department of Agriculture, at the 2018 Southeastern Wildlife Expo. Join us for storytelling, cooking demos and more from a roster of the Palmetto State’s greatest chefs, food producers and farmers. For full schedule click here. PRINCESS PAMELA BRUNCH IN WINSTON-SALEM! Matt Lee hosts a brunch at the Old Salem Visitor Center, in conjunction with the Bookmarks 13th Annual Festival of Books and Authors, supporting Princess Pamela’s Soul Food Cookbook. Tickets required: $45 includes a copy of Princess Pamela’s Soul Food Cookbook and breakfast inspired by the cookbook’s recipes prepared by California Fresh Catering. To purchase tickets, click here. Charleston signing during the Festival, at Blue Bicycle Books! Drop in before your Festival dinner plans to join Matt for an early-evening beverage and bite at Blue Bicycle Books’ King Street store, and to pick up a copy of our new book project, a reissued, upsized edition of Princess Pamela Strobel’s masterful and poignant 1969 cookbook. It’s the first in a new reissue imprint, “The Lee Brothers’ Library,” with Rizzoli Publications. THURSDAY, March 2, 5:30PM – 7:00PM. 420 King Street. For more info on Princess Pamela’s Soul Food Cookbook, read this story about the project at Food52. Hear us Talk New Projects at NYU! The evening of Tuesday, Feb 28th, please join Matt and Ted at NYU for a panel discussion of Princess Pamela Strobel, her legendary cookbook, and the challenge of preserving Great Migration stories, poetry and recipes for a new generation. Follow link for more details and to register. Come see us at Lake Oconee, Georgia!